I would like to start with the chat feature. It feels very “slacky” but brings a few things to the table that I really like that lacks in Slack. There are a number of ways to access chat within Teams. The first being channels. These are threads of communication. When a team is first created you get a “General” conversation thread. 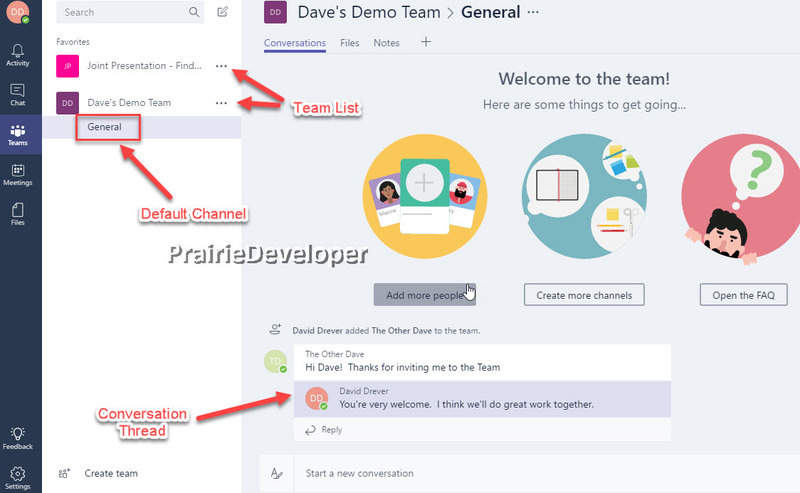 Users working on that particular problem can use the channel to discuss it and work on resolving it together separate from the other conversations happening in the General channel. Each subsection (or grouping) within a chat thread is a conversation. Unlike Slack, you can actually reply to a conversation thread directly instead of having to share the particular item you are responding to in order for others to know the item you are replying to. When doing this, the reply is attached to the conversation thread and not placed as a new message at the bottom of the screen like Slack does. Be careful though as it is really easy to accidentally reply using the conversation text box. A few times already I have been attempting to respond to a particular conversation thread and created a new one because I didn’t hit reply to the conversation itself and wrote it into the new conversation box. When replying, the person to whom you are replying to will receive a notification. This notification will permeate to wherever you have the Teams app install. This means you won’t have to be sitting at your PC to receive notifications as your smart device will also receive notifications if not configured to ignore them. One thing you need to keep an eye out for is the “New messages” notification. 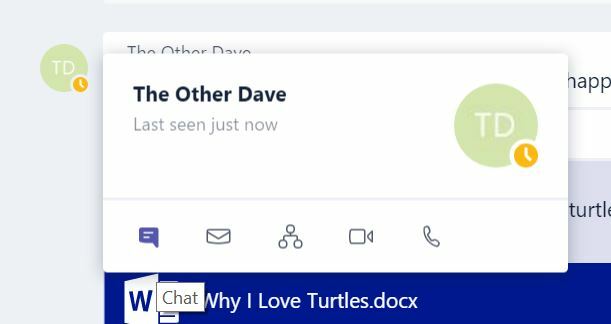 One thing Teams doesn’t do is auto-scroll for you when a new conversation is added to the channel. This is because the thought is if you are involved in a particular thread you don’t want to have to scroll back all the time to see that conversation every time someone starts a new conversation. As a compromise to those that do want to see new conversations, Microsoft has provided a notification within the app that new conversations have been added to the thread you are currently in. 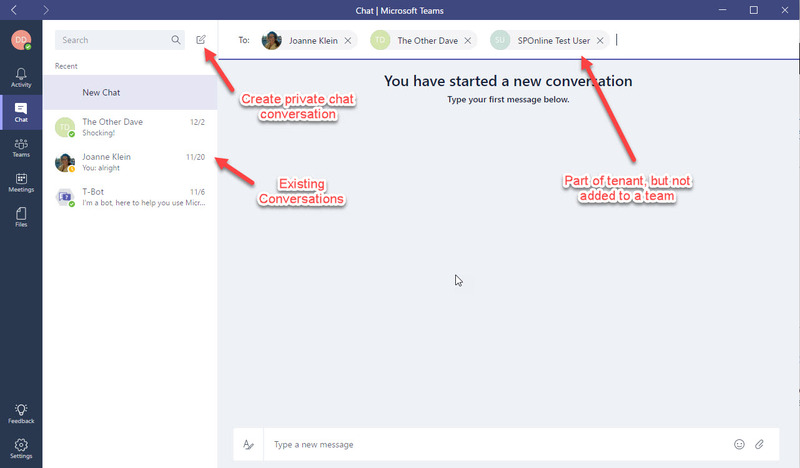 There are a number of enhancements you get with chatting in Teams. The first is the ability to add “extras” to your messages. These extras include things like emoticons, stickers, gifs and much more. One difference around these picture based extras is that in Slack you could type in “/giphy teams” and get a picture of a sporting team.. or something else entirely different (sometimes we wonder about that search algorithm). You don’t have any control on what shows up. 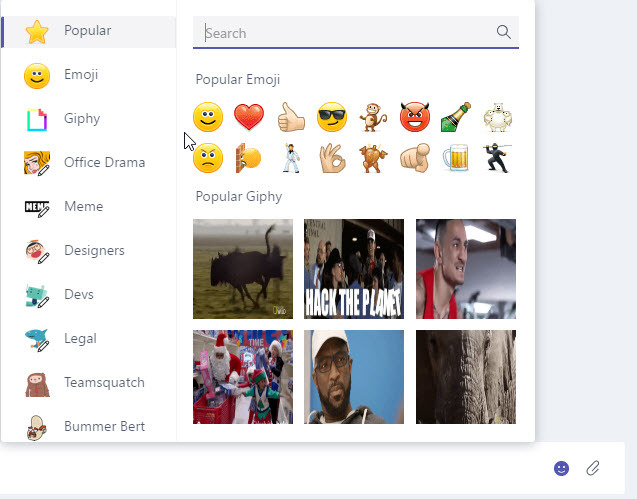 With Teams you get the option to search and select your giphy gif (…giphy gif *snicker*). A little bit slower, but not always a random selection then. 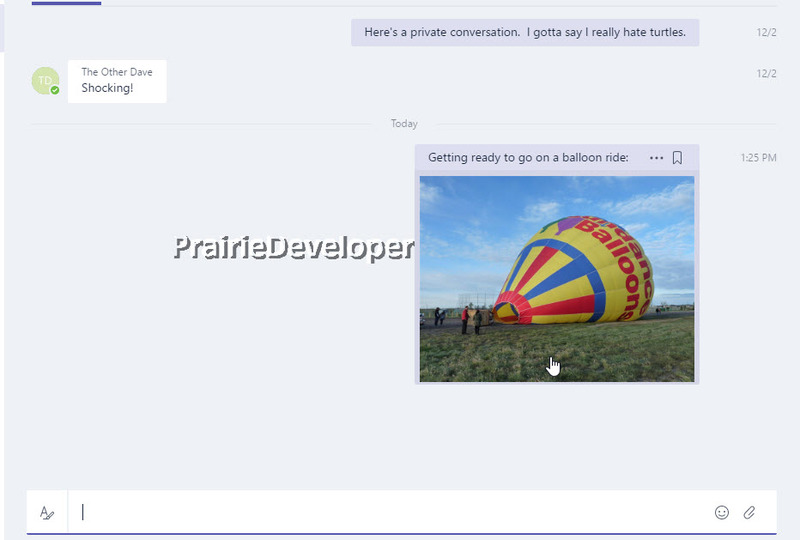 The next bit is the ability to add your own files to the conversation. Like many Microsoft products of late, this is limited to the file types that are not on the email file type block list. Unlike SharePoint on-prem, this list cannot be modified. Like Slack and other chat tools, if the file can be rendered in the screen it will be (for example: a picture). 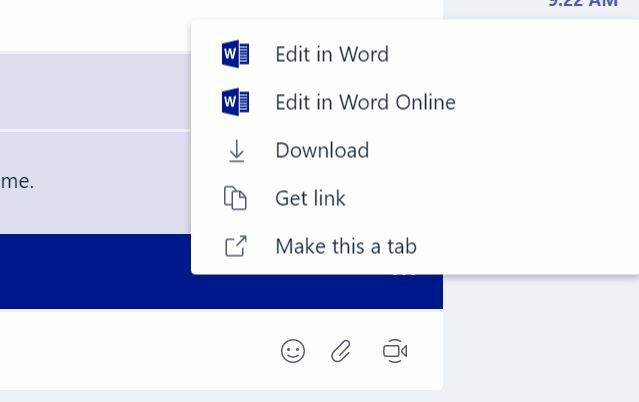 When uploading, you can pull directly from the OneDrive associated with your Teams login account. You will also have the option to upload a new file. The last item I want to mention with chatting in mind is the ability to quickly start a video conference. The conference invitation when initiated will be sent to all members of the group. Effectively what you are doing is creating an instant meeting within Teams (a discussion for another post). 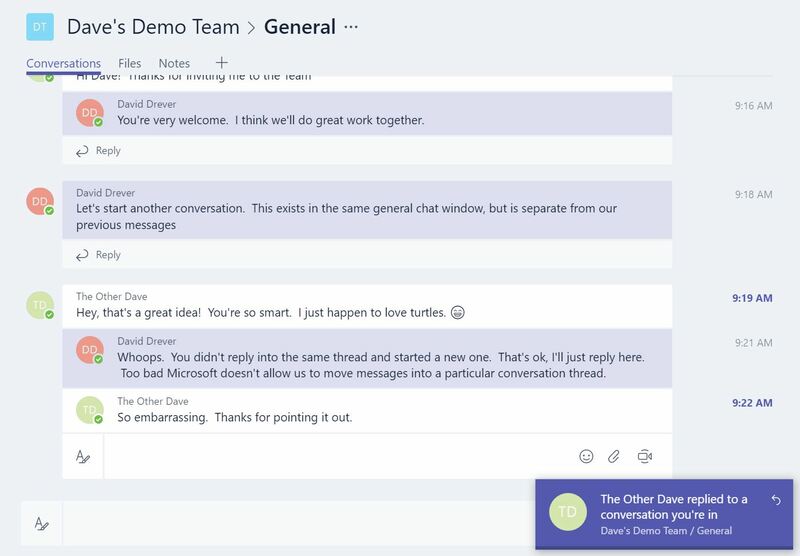 This launches Skype for Business within Teams. If you wish to only include a subset of the team you are involved in, you have a couple of options. You can create a semi-private chat group (see above) and then initiate the video call from there. The other option is to book a meeting with the subset of the team you are looking to include. Otherwise, the meeting will be open to all in the team. 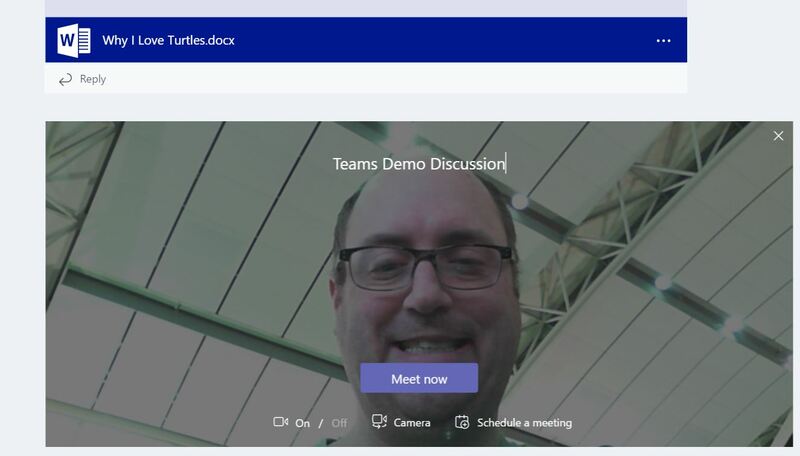 So that’s it for Microsoft Teams’ Chat functionality for today. 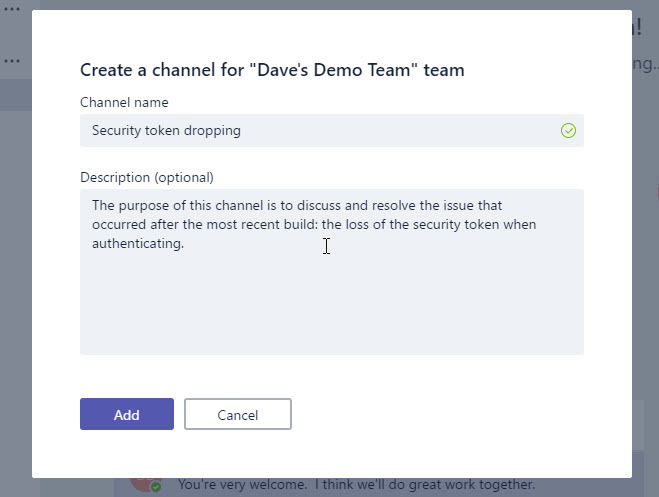 As I have said, I really like the chat features that Teams brings to the table. It’s really robust and offers a lot to just about everyone (in my opinion anyways). What do you think? Keep on the look out as I work through the other features of Teams in future posts.